Young parents who are leaving the care of Local Authority Children’s Services can be supported by musical activities, soundLINCS’ new evidence suggests. 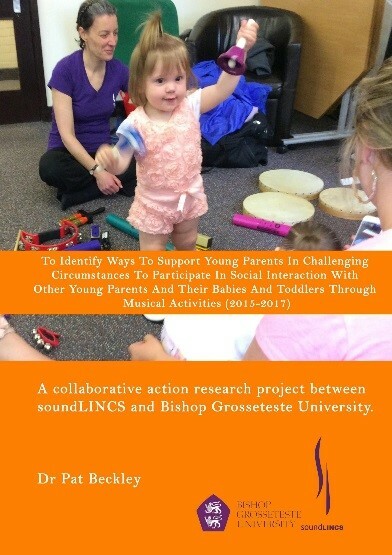 The study involved providing creative musical sessions in the young parents’ homes or supported accommodation for individual and group activities. A soundLINCS Music Facilitator planned and delivered the musical activities which also included ideas from the young parents involved. Inclusion increased participants confidence to trust their own ability to make decisions. One young parent who participated in the study commented ‘[I was] a bit nervous at first, meeting others in a new place’ but the sessions ‘gave me the confidence to attempt new opportunities’. She described her son to have ‘enjoyed the drums, instruments and singing together’. For further information about the Groove and Grow Research Report or to find out more about soundLINCS, visit www.soundlincs.org, visit the soundLINCS facebook page: www.facebook.com/soundLINCS or twitter: www.twitter.com/soundLINCS, email info@soundlincs.org or call 01522 510073.